At this stop, tour attendees were able to see a different aspect of peanut farming c ompared to previous stops. 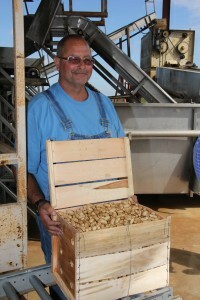 Vic Fleet, owner of Rolling Hills Farm, Inc., located in Colquitt, Georgia, plants green peanuts for boiling. A boiled peanut, botanically, is like a regular peanut. However, boiled peanuts are harvested earlier when they are still immature, and they are then boiled and soaked in salt water. The handling of green peanuts is completely different than that of a commercial grown peanut. A green peanut is a perishable product, and if not dried or frozen, will start rotting from the moment it is harvested. Once the green peanuts have been picked, they are taken to be washed, put into crates and then refrigerated until they are boiled, frozen or processed. Fleet has been in the green peanut business for about 10 years now. His peanuts are sold for $1.00 per pound and in 40 pound crates for $40.00. Vic begins to plant his green peanuts in April, which is earlier than commercial peanuts. On Fleet’s farm, he plants GA 11, which is a Virginia variety. This variety is a larger nut and is easier to get out of the shell. Fleet plants an average of 250 acres of peanuts, which he sells commercially. He uses 12 of those acres for his green boiling peanut business. Of course, after all the talk about these delicious green boiled peanuts, tour attendees were treated with this wonderful southern staple. Many of the attendees had never tried boiled peanuts before. Brock Ward, Miller County Extension agent, told the group that one quarter of everything that comes through Miller County is centered around peanuts.